via Pinterest - This is pretty close to my ideal interview outfit, but I would opt for similar heels of a lower height and thicker heel, and I would be carrying a large black tote. Also, one necklace is enough. The last two to three weeks have been hectic ones because of a few of those surprise interviews I sometimes allude to. I am, however, happy to report that my interviews went well! Over the last several years of school, I've accumulated quite a bit of experience with dressing for interviews in my fairly conservative field while on a student budget, so I thought I would take the opportunity to talk about reasonably affordable business-formal interview clothes. While I think there is still a wide range of acceptable styles that fit within the "business-formal interview" dress code, most of my women classmates err on the extremely safe side when it comes to dressing for their interviews. This is perhaps despite the fact that fairly permissive business casual dress codes are the day-to-day norm for most of our corporate workplaces, which suggests that most interviewers probably don't care much about any particular business-formal detail. That constant risk that someone might still care (i.e. that someone thinks pantsuits for women are less formal, that patent leather shoes are not okay, etc. etc.) still drives most of us to make extremely conservative choices. Over time, I've found myself defaulting to the same uniform every time I have an interview, sticking to the same pieces or colors. Interviewing is stressful enough, so I like to save my mental energy for other preparations. 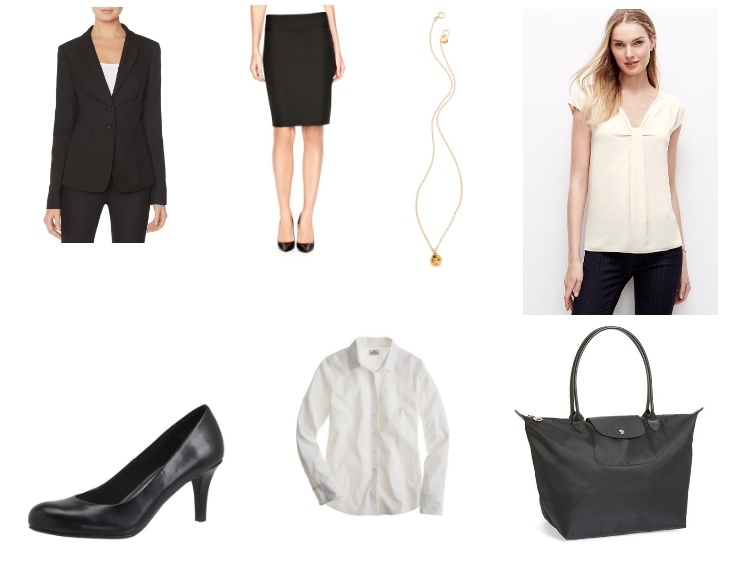 I should mention at the outset that, because this post is about interview clothing on a student budget, I include some items that come from the fast fashion side of things. As I mentioned in my previous post, sometimes that's just the reality when your budget is limited and your needs are very specific and somewhat time-sensitive. At the same time, a lot of the items are also not the most frugal in their category. I often find myself needing to spend a little more to buy something that is more functional or that fits me better when it comes to interview clothes. If business-formal interviews are an important part of your life, I think some of the more expensive pieces can be worth the investment if they truly are more suitable for one's needs. The main criteria I've used when picking out my interview clothes in the last several years include (1) affordability and (2) versatility, balanced against the need for items that (3) fit reasonably well off the rack on my atypical top-heavy body type with minimal tailoring. Because of potential issues with fit and because I rely heavily on sale items whenever possible, I do a bit of mixing and matching with suit separates from different stores. Loft, Ann Taylor, and the Limited are my usual stores of choice when it comes to suit separates, both because of price (frequent additional percent off sales) and fit (when compared to say, Banana Republic, which does not suit my body type). To be honest, I find black suits extremely severe and would prefer a suit in dark gray or navy if I had more time to shop and if budget, fit, reliance on sales etc. were less of an issue. Black separates from different stores generally match better than the different shades or textures of navy or gray that might be available across different stores. Also, I find that black skirts in particular fit my business casual wardrobe better than other colors. Black Blazer - I strongly prefer two-button styles over one-button styles. Two-Button Jacket (The Limited) - I got the sleeves shortened, but the regular sizes otherwise fit me well off the rack. All Season Stretch One-Button Jacket (Ann Taylor) - I own this jacket and it is alright. Ann Taylor and Loft have not, to my knowledge, generally sold two-button basic black blazers in the last three years, which distresses me. Black Pencil Skirt - Skirts should be close to knee-length. Wide Waistband Pencil Skirt (The Limited) - My favorite pencil skirt. The regular sizes are the exact right length for me off the rack. Tricetate Pencil Skirt (Ann Taylor) - I've had good luck with Ann Taylor's pencil skirts too, though I don't own this specific one. I imagine Loft's pencil skirts would be similarly suitable. All Season Stretch Pencil Skirt (Ann Taylor) - See above. I find (mysteriously) that both regular and petite skirts at Ann Taylor generally work well for me. White or Cream Shell or Button-Down - Many other colors are also perfectly acceptable, but I find white or cream to work best with my skin tone and be the most universally flattering. Pleated Cap Sleeve Top (Ann Taylor) - I own this top from another season and love it. The v-neck detailing is flattering and the neckline is still modest. Silk Sleeveless (Everlane) - I highly favor silk tops from several seasons back at J. Crew for my interviews. I like the way silk hangs on the body when compared to other fabrics. Scouring sale racks for suitable cream or white silk tops could be a good strategy for finding interview tops. Everlane's pricing and quality are also alright, so I include it here. Stretch Perfect Shirt (J. Crew) - I generally prefer not to wear button-downs because I find them boxy and unflattering as a general rule with an added risk of gapping and buttons coming undone. After trying button-downs at quite a few stores, I found that this shirt is the best fit for me. I wear a fitted white tank top underneath to mitigate the risk of wardrobe malfunctions. I always use this one or this one (H&M). Black Leather Pumps - I prefer shorter, chunkier heels because I am clumsy. I also prioritize comfort over style when it comes to shoes. Finally, I might not be a big stickler for high quality in this area because I always commute to my interview site in flats or boots if any walking is required. Karmen Pump (Payless) - I can't personally vouch for these, but multiple friends report that they're extremely comfortable, including for a commute. Lennox Pump (Naturalizer) - One of my main pairs of interview pumps is from Naturalizer. These are a very basic pair. Bromstad Grifton (Naturalizer) - These have a bow detail with metal hardware in a design that I find reasonable for interview shoes. They're also 70% off right now. Subtle Jewelry - I stick to a small necklace and a pair of pearl studs. Chloe Necklace (Gorjana) - I wear another Gorjana necklace. There are of course, many options at various price points when it comes to small, subtle necklaces. Pearl Stud Earrings (Amazon) - I wore these daily for years before one of the pearls fell off the post. Handbag - I need one that is large enough to carry a change of shoes for walking/commuting and a leather portfolio. Le Pliage Neo (Longchamp) - I have a black Planetes tote which is an earlier version of the same design. I know this is not at a student-friendly price point, but I find that this bag is good for school, work, travel, and pretty much any other context one can think of. It looks professional, is waterproof, and is light and can carry a lot of stuff. In short, I think it can be worth it based on the excellent cost per wear value. I also own the black Planetes tote (I wonder why they changed the name?) and while I was unsure of the purchase at the time (since it is a pricey simple nylon bag for an undergraduate student), I'm happy I bought it. It's so versatile and lightweight. On another note, do you usually stick to pencil skirts? I'm looking for black pants and it's difficult to find a decent pair. I have stuck with pencil skirts since I started graduate school. Because I'm short (and short of leg for my height to boot) I have a really difficult time finding pants that fit well and I think most dress pants are rather unflattering on many body types. So I end up opting for pencil skirts largely because its easier to find one that's relatively flattering, looks like it fits right, and looks professional. I do own one pair of petite dress pants from Loft, but they're straight leg, with a slightly tapered fit, and look sort-of-cropped - likely not suitable for interviews though okay for work! As a side note, It did take me a long time to get used to the top tucked in to pencil skirt look (I think it, like other "high waisted" looks can be a bit strange on a top-heavy figure), but I like it now and prefer it to any pantsuit look.